Let the cube revolution begin! Zarvot is a new game coming to the Switch later this month from snowhydra games. You’ll be able to tackle the game solo with complete story campaign or a total of four players can duke it out. Check out the developer video below to get a better idea of what to expect! 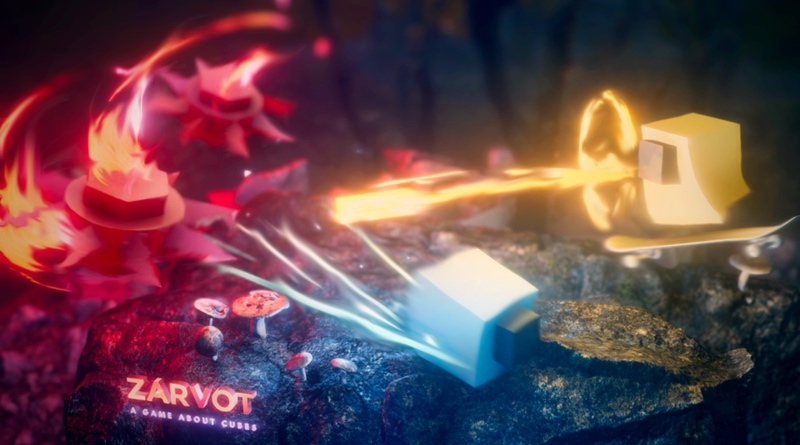 New York-based independent studio, snowhydra games has released a developer walkthrough demonstrating both the competitive multiplayer and solo story campaign in Zarvot, a whimsical game about cubes that sometimes love and sometimes hate each other. Launching exclusively on Nintendo Switch this October, Zarvot features four-player local multiplayer as players assume the role of anthropomorphic cubes that are tasked with blowing each other to pieces. Inspired by titles like Bomberman and TowerFall, Zarvot features easy to learn controls that still allow for a lot of depth and flexibility. Set in a series of destructible combat arenas across five game modes, you’ll have to master the minutiae of rapid fire, charge shots, evades, and area attacks if you want to best your buds at this gloriously upbeat competitive arcade affair. There’s also an asymmetrical multiplayer mode called Joy-Vot, wherein one player spawns in enemies to fight their friends. Additionally, Zarvot features an entire story-driven single-player campaign, as players assume the role of Charcoal and their pal Mustard, a pair of affable cubes determined to cheer up their friend Red on their birthday. This heartwarming journey will take players through nine different zones, featuring fully realized dioramas of an abstract world that operates not unlike our own. These comical, cosmopolitan cubes still need to go to flower shops, ride the metro, and sleep in their beds. In Zarvot, snowhydra takes the most humdrum of inanimate objects, and turns them into some of the most well-realized animated characters you’re likely to find. Video Updates: Tied Together, Legend Of Evil, Dark Souls, Zarvot, & More!